At least, that’s how the New York financial institution’s chief technology officer, Nick Rosenberg, describes them. While most banks cling to the adage “blockchain not bitcoin,” Metropolitan stands out simply by being one of the very few to enthusiastically court deposit business from crypto firms. So far, it’s proven a lucrative niche for Metropolitan. In the first quarter, cash management and foreign exchange conversion fees from cryptocurrency clients totaled $3.4 million, the bank disclosed in an investor presentation. This helped drive a more than 300 percent increase from a year earlier in Metropolitan’s total non-interest income, to $5.4 million, according to a Securities and Exchange Commission filing. 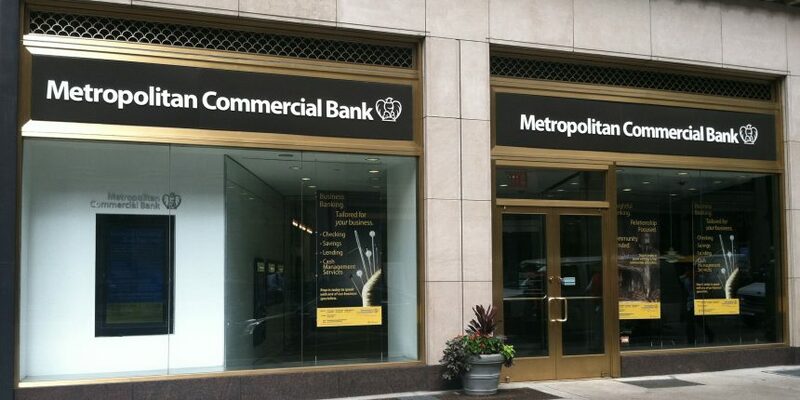 If that doesn’t sound like a lot of money, keep in mind that Metropolitan is a community bank. With just $1.9 billion in total assets, it’s less than one-1,000th the size of JPMorgan. What’s more, that triple-digit rate of growth is astronomical for the U.S. banking industry, where non-interest income for all institutions climbed a measly 7.9 percent during the same period, according to data from the Federal Deposit Insurance Corp. Yet despite the lucrative demand from crypto companies for banks to provide fiat liquidity and other traditional services, bitcoin-friendly banks like Metropolitan are still as rare as they were three years ago. One reason Metropolitan Bank is an outlier in embracing the crypto industry is that most banks can’t stomach the risks. Chief among them is the regulatory risk. Anti-money-laundering regulations require banks to identify their customers and even their customers’ customers, plus track the flow of funds. While public blockchains can help banks and law enforcement trace the movement of money, the pseudonymous nature of crypto addresses makes it hard to determine who is ultimately sending and receiving funds. Bitcoin’s historical association with underground drug markets certainly doesn’t help. As bullish as they may be, Metropolitan’s bankers still recognize the risks of working with crypto clients. “It’s a high-touch relationship,” Rosenberg said, meaning one requiring extra diligence. With regard to risk management, Rosenberg said there are two crucial keys to serving crypto clients. The first is being extremely selective about client acquisition, only working with companies that take compliance as seriously as the bank does. The second is maintaining an open dialogue with regulators. Compliance aside, Metropolitan also has to insulate itself from the volatility its cryptocurrency customers live with every day. As noted above, the bank only works with fiat currency like dollars, never touching cryptocurrency directly. But more subtly, it’s minimized the risk to its own balance sheet in the event crypto depositors’ balances suddenly shrink. To illustrate why this would be a concern, the settlement accounts it maintains for exchanges totaled $281.2 million on March 31, representing 17.4 percent of the bank’s total deposits, according to the SEC filing. Such a high concentration might normally be worrisome. However, Metropolitan isn’t using these accounts to fund long-term assets like mortgages, just cash and equivalents. So, even if they were drained at once, it’s far from a run on the bank. “They do not utilize a lot of these deposits in their everyday operations, just because they do know there is significant volatility there,” said Collyn Gilbert, an analyst and managing director at the investment banking firm Keefe, Bruyette & Woods. To be sure, Metropolitan held another $100.8 million in corporate accounts for cryptocurrency firms, making up 6.2 percent of total deposits as of March 31. And these accounts do fund assets on the balance sheet. But corporate accounts, which clients use for normal business activities like payroll, are less volatile than settlement accounts, which hold money only temporarily until a transaction is completed, Gilbert said. In January, the bank sent its customers a reminder of what it said was a longstanding policy of not accepting crypto-related wire transfers from entities outside the U.S. Word leaked out to the press, which reported this was a new policy prompted by fraud. Metropolitan had to issue a public denial of that claim to quell backlash. Setting aside the fee income and interest-free funding on deposits, there’s a more intangible benefit Metropolitan gains from banking cryptocurrency firms, one that arguably compensates for all the risks. Namely, it gets a front-row seat to the revolution and is learning about how cryptocurrencies perform in the wild. Ciccolo agreed that serving this sector has given Metropolitan a competitive advantage. Indeed, the bank’s director of new products, Kyle Hingher, said Metropolitan hopes to someday be one of the leading banks serving the emerging token economy, once the opaque regulatory landscape clears up. For now, of course, even companies with cypherpunk ideals benefit from working with traditional banks to tap into audiences and services that utilize fiat currencies. Liquidity lends any crypto startup greater usability. “If something is really going to succeed, it’s going to require a banking partnership,” Hingher said. Looking ahead, the Metropolitan banker is keeping close tabs on the emergence of security tokens and blockchain-based settlement systems.